This place was highly recommended as a place to have a sweet treat. I found prices to be high, we purchased the popcorn and it was tasty. The bag size was small but probably a good thing. We were at the Thursday night Market and my friend escorted us to Brandini Toffee. She said it is The BEST.... and always gets some to take to friends when visiting in other places. Bought some Toffee Crumbles for the top of Ice Cream. Yum! Need a Palm Spring souvenir? Look no further. Brandini Toffee is delicious! I almost never eat sweets but I cannot resist their delicious toffee. They have stores in Palm Springs and Rancho Mirage and I love that two young high school students had the idea for this thriving business! YUMM! Always exceptional. Stop in for a bite or a really great gift for someone you love. Easy street parking, good signage and friendly staff. Ice Cream Bar is to die for! Be sure to share the ice cream bar. It is hand dipped and rolled in toffee candy crumbs. Delicious. The Toffee candy is wonderful as well! I had a sample while walking the streets. I had another sample at the nigh market - and had to buy some. It's really the best toffee ever and certainly nice to support a small local business. A group of us did the Village Fest walk on Thursday night. Brandini was handing out samples. Once you taste the toffee, you just have to buy more. Our friends bought gift's of toffee to take back home for family. 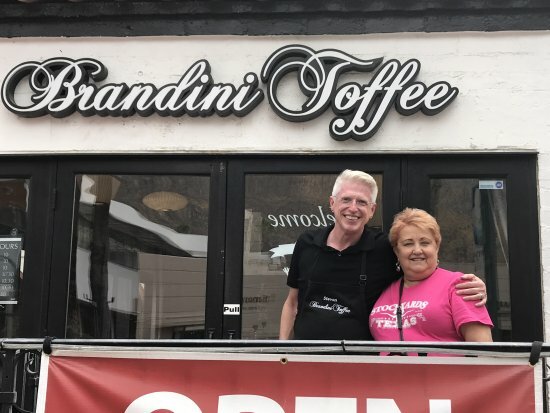 Get quick answers from Brandini Toffee staff and past visitors.